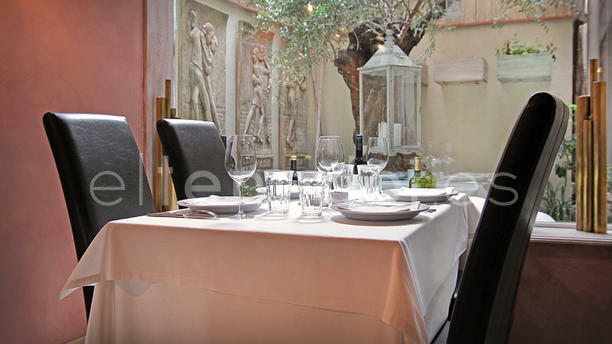 "Todo Pasa restaurant, on Vila i Vila Street in Barcelona in the currently most fashionable neighborhood in Barcelona, is the meeting point between selected premium meats and master grillers. An authentic and typical Argentinean restaurant. On its menu are the magnificent Creole Empanadas, the delicious home-made pasta legacy of Italian grandparents and unbeatable fish and seafood in pure Mediterranean style. Delicious desserts and its exclusive wine cellar with the best wines in the world. They are cooks, and their pleasure is to make customers enjoy the highest excellence in their dishes. In a familiar atmosphere with the warmth of good care, remembering the old Inns of the old neighborhood of San Telmo in Buenos Aires, they take care of each and every one of the key factors of the quality of the meats: breed, upbringing, and age of the animals, qualities that determine the flavor, tenderness and juiciness. If you want the experience, now you know, book!" Excellent steaks! A little pricey, but that seems to be the going rate for the quality they provide and we got 30% off booking through the fork. The service was excellent. Make sure to try the desserts. Bottle of Malbec for under 14€ too. Runsteak was amazing. Chicken was perfect. Everything was great and good service! We ate a three course diner here with Fork discount. The empanadas for a starter were ok, the beef was quite good but the side salad was really poor. The dessert was ok but not special. All in all only the meat was good, the rest was average to ok. The waitress did her best to ignore us which felt quite impolite. The meal was far to expensive for what was served but with the discount it was ok. Excellent service, amazing food and the discount from this app was a brilliant bonus! These people really know how to serve fantastic steaks. The taste of the food was amazing. The best steak so far in Barcelona. Shared a ribeye with friend, and salad was included. Great Malbec wine. We received a 40% discount booking through trip advisor. Total bill $48 including French fries, dessert and 3 glasses of wine.